Large, low platform with non-skid mat for stability and easy access. 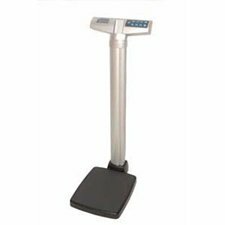 Has an easy-read, 1" high LCD readout, user friendly interface features such as BMI (easy scroll method), Hold/Release, Zero, KG/LB, Clear & Enter functions, Auto-Zero, 2 minute Auto-Off (AC mode disabled), low battery indicator. Includes a strong aluminum pillar, EMR Connectivity via USB Port and (6) AA-cell batteries or 120V AC adapter. 2-year limited warranty.